The easiest way to buy your KTMB Electric Train Service seats is to book your ETS ticket online. This saves you the hassle and cost of having to travel to your nearest railway station to buy your train tickets. To book online ETS train tickets for these fast trains (tiket keretapi laju) you can use the KTMB website, or an online ticket booking agent in Malaysia who sell tickets at the same price you would pay at the station ticket counters (an admin fee may apply). 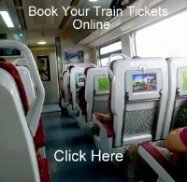 Currently the KTM website is the best place to book ETS Train tickets online, as it works out the cheapest. You can book your ETS ticket online direct from KTM (currently this is the cheapest option). They are also good for bus, ferry, taxi / private transfers and flights around SE Asia. visit our online bus booking page for alternative travel arrangements. Book train tickets direct from the Malaysian Railways - Keretapi Tanah Melayu Berhad website (KTMB) - You now no longer need to register for an account, but still must sign in as a guest if you are not registered. ETS Senior Citizen price train tickets can now be booked online via the KTMB website (available for Malaysian citizens only). The older ETS Trains in Malaysia operate from Kuala Lumpur's KL Sentral Railway Station to Ipoh in Perak with many trains a day going to Ipoh. KL Sentral, Kuala Lumpur (old Railway Station), Kepong Sentral, Sungai Buloh, Rawang, Batang Kali, Kuala Kubu Baru, Tanjung Malim, Behrang, Slim River, Sungkai, Tapah Road, Kampar, Batu Gajah and Ipoh. New Services to the border with Thailand are now operating as the new KL to Padang Besar route has started. KL Sentral, Tanjung Malin, Tapah Road, Kampar, Ipoh, Kuala Kangsar, Taiping, Parit Buntar, Sungai Petani, Alor Setar (for the ferry to Langkawi from Kuala Kedah), Arau (for the ferry to Langkawi from Kuala Perlis) and Padang Besar on the Malaysia / Thailand border. Another new ETS Gold Service operates between Kuala Lumpur and Butterworth in Penang. A new ETS route up and running is the Butterworth to Padang Besar train. Butterworth Penang, Bukit Tengah, Bukit Mertajam, Tasek Gelugor, Sungai Petani, Gurun, Kobah, Alor Setar, Anak Bukit, Kodiang, Arau, Bukit Ketri and Padang Besar. From 1st January 2016, this ETS route is being replaced with a new Komuter Service between Butterworth and Padang Besar. The latest routes added on the 10th October 2015, now starts south of KL at Gemas, with one route to Butterworth, the other to Padang Besar. This has added a few more stations to the ETS route south of KL. Bandar Tasek Selatan, Kajang, Nilai, Seremban, Tampin (Pulau Sebang) and Batang Melaka.